Knowing your abdominal muscle anatomy can help you exercise your ab muscles, get ripped, and be some useful info to absorb between workouts. When you know which muscles you're working it'll help you work them better. 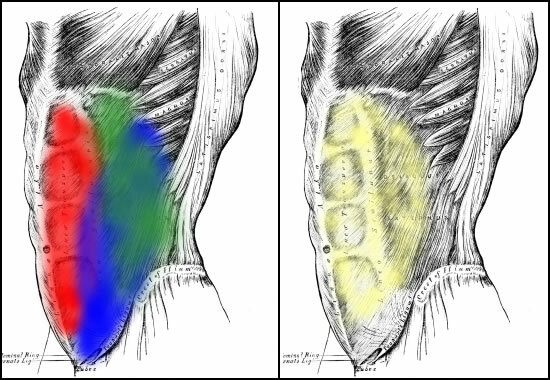 The red is your rectus abdominis, the blue is your external oblique, the green is your internal oblique, and the yellow is your transverse abdominis. Note how the is under your other 3 ab muscles, but covers almost your whole abdominal cavity. These are your four muscles that you should work if you want a stronger core, an advantage in certain sports (wrestling, tennis, jujutsu, etc. ), or a six pack. Make sure you're working each of them in your workouts - not just 1 or 2. The rectus abdominis muscle is your 'six pack' muscle. It runs from your pubic bone all the way up your torso till your chest. This muscle allows you to pull your chest toward your hips, and vice-versa. It lies just below your skin, and with a low body fat percentage you see it as a 'six pack' or 'eight pack'. The external oblique is on the side of your body, with a slight diagonal inward. It attaches at the top of the pubic bone and hip. Your obliques contracts to twist the trunk of the body - your right oblique helping you twist to the left, and your left oblique helping you twist to the right. Any sport than involves twisting your torso is assisted by making this muscle stronger. Your internal oblique lies under your external oblique, deeper in the trunk of your body. The left oblique helps you twist to the left, and the right to the right. This muscle helps with any twisting type action you perform. It runs from the top of your hip and attaches to your lower ribs. Side bends work both of the oblique muscles. This is the deepest muscle of your body's trunk, the foundation of your abdominal muscle anatomy. It is large and runs horizontally across your abdomen, under the other 3 abdominal muscles. This is worked when you raise your legs and knees, as well as when you 'sucking in' your stomach to look thinner. There you have it. Whether you're going for strength or beauty, get all your muscles involved and focus on each one when you work if. For beauty, make sure your 6 pack exercises involve your entire abdominal anatomy - don't settle for a half baked workout. If you work them really hard, you can even get your rectus abdominis to make 8 pack abs. And if you really want to get ripped, read my How to Get Abs e-book. It's the best guide out there for getting ripped quickly, and staying that way. Also, knowing your abdominal muscle anatomy will help you make the most of your ab exercises. If you just want strength, use heavier and heavier weights to work these 4 muscles. The trunk of your body will be rock solid. • Click here to learn more about the Ab Workouts and Exercises! • Click here to leave 'Abdominal Muscle Anatomy: How Abs Are Put Together' & go back to the Complete Strength Training Home-page! 1. Brungardt, Kurt. 1993. The Complete Book of Abs. New York: Villard Books. Pp. 9.